I’ve created a Donate Spot. It’s far from ideal, because it isn’t hidden completely away or contained within a cutesy basket. Then, I’m stuck going back through the pile, which . . . just . . . . makes me crazy. I’d love for my Donate Spot to be in the garage. But for now, that isn’t possible. My garage is a black hole. My brain has an amazing ability to block out its condition and contents, and things can be out there for . . . well . . . forever. Other than the three to four times a day that I trip over something on the way to the car, I can’t be held responsible for knowing or remembering what’s out there. This probably has something to do with my this-will-go-in-the-garage-sale-that-I’ll-someday-have-so-I-can-stick-it-out-there-and-forget-about-it-for-months mentality. But with my newfound love of consistently donating, I’ve decided that the Donate Spot works best. Yes, it’s an eyesore, but I kind of need an eyesore so I’ll remember to donate when the opportunity arises. January has been a very good month for decluttering around here. I’ve donated quite a bit, but I’ve also thrown away a lot, too. I reluctantly cleaned under my kitchen sink. Quite a bit of glassware went to the Donate Spot, while things like the faceless Beethoven statue went into the trash. Motivated by the impending arrival of the Bug Man, I cleared the floor of my closet. I was embarrassed to admit that this dumping ground . . . was truly a dumping ground. Much of what covered the floor and required me to do gymnastics to reach my hanging clothes . . . was trash. I pulled everything from my bathroom cabinet, and finally parted with quite a few free-after-coupon items that I’d had, but hadn’t used, for several years. I donated most of it, but realized how my clutter causes such waste, when I had to throw away things expired long ago. Because they were hidden away for so long in the pile, no one was able to benefit from them. I gave myself permission to part with a mess-making decoration that frustrated me more than it gave me joy. I discovered that as I go through this process, there are layers of progress. Even though I love how much better my office is than it was pre-blog, certain things were starting to bug me. I finally tackled a jumble of “useful” stuff . . . that was no longer useful. There was a time in my life when ebay shipping supplies needed to be within an arm’s reach, but that time has passed, and those supplies are now clutter. I even tackled the task I’d pretty much sworn I’d (almost) never do. I cleaned under my couches. And as always seems to happen, I was shown the error of my stubborn ways. I found the library book that we lost . . . last summer. And last, but far from least, I accomplished one of my big goals for the year. I organized my laundry room. It was quite a job, and I don’t know that I would have done it if it weren’t for my daughter’s sickness meaning I was home on a day when I had expected to be out. But, now that I’ve completed my first Laundry Day in it, I’m practically giddy over the difference. How easy it is to forget that having a clear laundry room floor really does make it easier to do the laundry! I love doing these monthly decluttering updates because I love to celebrate progress. I live in this house every day. And sometimes, when there’s laundry waiting to be folded on the loveseat and shoes strewn everywhere, it’s easy to forget how far I’ve come. I can almost guarantee that some months of 2011 won’t have as much decluttering progress to report, but knowing that all of these things have left my home (either in a thrift store truck or a garbage truck) is a great way to inspire myself to keep decluttering! I’m so excited to read about your decluttering progress in January! 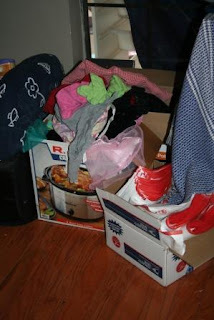 Amy at The Finer Things in Life has passed the monthly Decluttering Update torch to me! Leave a comment, or join in the linky below! If you do link up a blog post, please link back to A Slob Comes Clean. It is times like this month where I wish I had a blog, so I could 'report in'. Something about sharing with others that makes the accomplishments feel so much better. I had a forced cleaning out done to me. I got new floors put down, which meant having to box up every room in the house so the items could be moved out and floors could be laid. At the moment several rooms are still shoved together in my living room and dining rooms, but it gave me a deadline, which I work so much better with. As I was boxing up I was able to put stuff in the to go pile, but I have more stuff that I didn't have time to go through, still left to deal with. While my two bedrooms were completely emptied out, I decided I would paint the rooms. Nothing like a fresh coat of paint to give you new perspective. I know as I put things back in to rooms, I will have to sort out some more items. My goal is to only keep things I love and that make me happy, rather than things I have just because it is there or was given to me. I can't give exacts on how much has been or will be removed from the house. Partially because I didn't count every box that went out into the storage building (My Garage Sale Holding area) and partially beacuse I am a very long winder typer, so we'd be here a while. 🙂 Let's just say that I have a huge amount of stuff that has already left my house, and I live there alone! I have way more stuff that one person needs! But I am working my way through all the emotions and thoughts of letting go, and am proud of the accomplisments so far. I hope 2011 brings great things to all of those people out there that are trying to not only declutter their homes, but also their lives. Wow, Trace, you did so much this month! It is so true that deadlines help with motivation. Great job on all the work, and good luck as you continue! I participated in Amy's challenge last year and got rid of a LOT. Thinking I'd not be able to declutter as much this year, I set my goal for 30 things per month. Well, I'll need to rethink that after still finding 222 things in Jan. to get rid of! I freecycled, recycled, donated & threw away that stuff. My goal for Feb. is 50 things. My 'garage sale pile', by my back door has grown some more in the last two days. Once it gets above freezing I'll carry it out to the storage building behind the garage. We are planning a massive garage sale come spring. Until then I am slowly trying to add to it. You are a major inspiration in this household! Ugh, I was supposed to declutter? I've been working so much OT that I'm lucky to keep up with laundry let alone dishes. However, I am happy to report that when we finally put away the Christmas bins, I pulled out Christmas clothes that aren't flattering and will be donating those. I'm lucky that a charity calls me every 2 months saying, our truck will be in your neighborhood, do you have anything to donate? So I just accrue a little stack and donate every time without having to actually deliver it to a thrift store. I posted above under Trace about my January adventure. I decided to start a blog, and this is a recap of one of my room projects. Today my daughter took 3 huge baby toys to consignment. 1 they didn’t accept. But it’s not coming back in this house! \it’s staying in the car until we drop it off somewhere. And I mean it! I created a donate spot next to my front door (in my living room!) so I wouldn’t forget to take the items with me on days the recycling center, etc. were open. Great idea! Except that SPOT grew and grew until it took up about 1/3 of the living room floor and a section of my sectional couch! I’m happy to say I sorted through it last week and carted off as much as would fit in my car. And took it to the new-ish drive-through City recycling center. To learn I DON’T HAVE TO SORT IT!!! So now I’m working on creating a PERMANENT donate/recycling center near the garage door so I can easily take it to the car as I’m headed out. WOOT WOOT!! !